Besides bonding, repair, sealing, closing, those basic functions, decoration is a unique application of hot melt adhesives. Some users in foreign countries like to add some paints or nail polishes on glue sticks after getting cooled off. A better choice is going with Tex Year glitter glues sticks in order to save the process of coloring. Glitter glue sticks serve another type of special decoration effect, and also can be substitute of wax sealing, which was commonly adopted by ancient European aristocracies while sealing letters. We also can see innovative applications of hot melt glue sticks on line, such as earrings, wrist bands, necklaces, apparel accessories, and mobile phone decorations. We need more and more innovations on glue stick applications from your creativities. 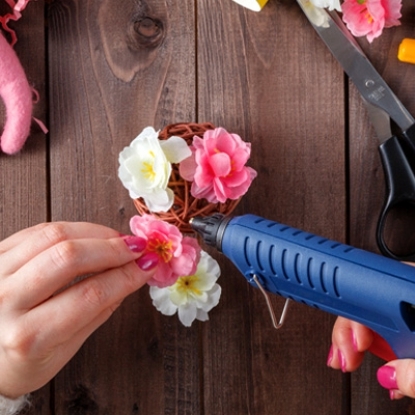 Please go with Tex Year mini glue gun for your ideal operation. Please go with Tex Year standard glue guns for your ideal operation.